Here’s an itinerary: fly to Paris from New York. 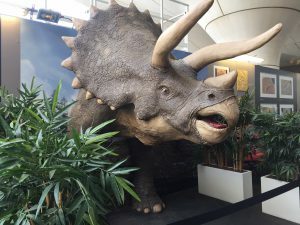 Take a train from Aeroport Charles DeGaulle to the lovely Gare Austerlitz, which shares space with a natural history museum and features this lovely beast. Après le rhino, continue by train to the colloquium Harlem à Limoges, celebrating the Hot Club of Limoges (1948-2018) and beautifully programmed by Anne Legrand. There is also a vast and well organized exhibition at the public library. 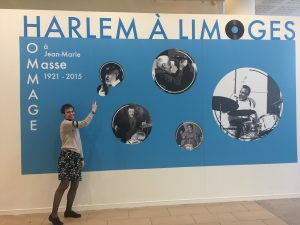 Information in French here. Historians presented 16 papers at the colloquium, most in French. 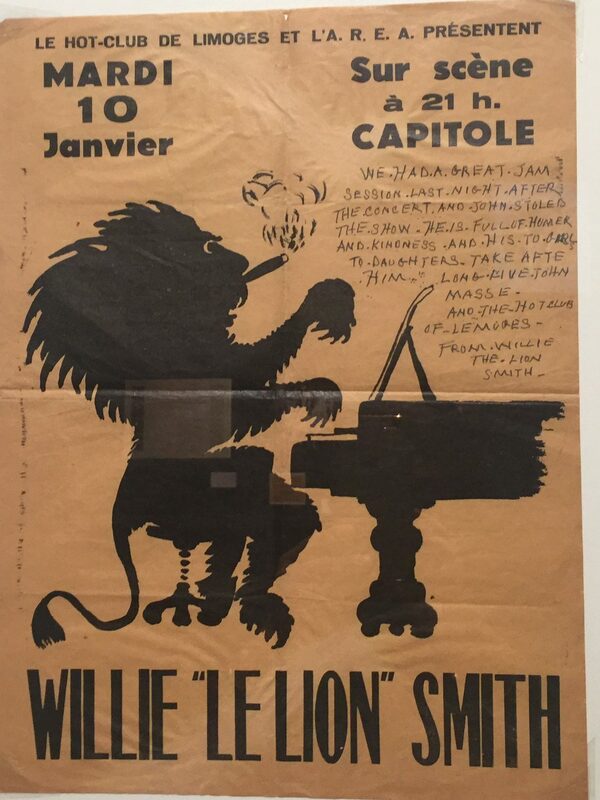 For example, the scholar Ludovic Florin talked about Willie “the Lion” Smith, one of the original stride pianists. Born this month (November) in 1897 and a child of Newark, NJ, Smith enlisted in the Great War in 1916. He served as a Harlem Hellfighter in the trenches of Champagne. Florin says Smith was decorated — maybe twice — for his courage. UPDATE/CORRECTION: In response to the above para, Anne Legrand writes Smith wasn’t with the Harlem Hellfighters but with another regiment, the 350th [Field Artillery], and the leader of the band was Tim Brymn and his Black Devils. There’s more about Brymn on Wikipedia, here. 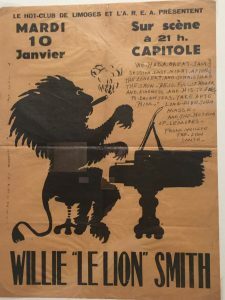 In 1950 Smith returned to France to perform for the Hot Club of Limoges. The poster is below. Florin concluded his paper with a recording of Smith playing his “Echoes of Spring” which always makes me cry.